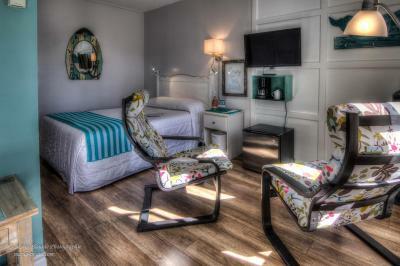 Lock in a great price for Motel le Beluga – rated 8.6 by recent guests! Perfect for a one night stay. We couldn't have asked for a better location. There is a free shuttle service for the whale watching tour. Great place to take a walk in the evening and early in the morning. The motel restaurant serves incredible Angus beef. We were within walking distance of a fantastic bakery Pain & Chocolat. The harbor is a 10 minute walk away. Many good restaurants within walking distance. Would definitely recommend. Good location close to Tadoussac centre. Room small and bathroom tiny but clean and freshly decorated and bed was comfy. Quiet. Recommend taking the breakfast option. Breakfast in their restaurant was good. Service a bit slow but tasty breakfast cooked to order. Fine dinner and breakfast at the restaurant. Conveniently located. I was located in the Motel section, which was right behind the Hotel itself with its own parking lot. It was a quiet and beautiful room. Location of the whole lot couldn't be better. Very beautiful, cozy place. Perfectly located and quiet. Staff was really accomodating and went out of their way to ensure we had a great stay. We stayed at the Motel and really enjoyed the "mini-veranda" that we could sit out on at night, as well as the picnic tables and sheltered chairs and swings in front. Dinner at the restaurant was enjoyed by everyone. Close to everything. Overall just a really nice and friendly place to stay. Motel le Beluga This rating is a reflection of how the property compares to the industry standard when it comes to price, facilities and services available. It's based on a self-evaluation by the property. Use this rating to help choose your stay! Located in Tadoussac's city center, Motel Le Beluga offers an on-site restaurant. Free WiFi is available. A cable TV, balcony and private entrance are offered in each room at Le Beluga Motel. Rooms also feature a refrigerator and coffee machine. A common area with hammock is available for guest use. Le Beluga also features an outdoor terrace and free parking. Guests can make reservations at the reception for whale watching cruises. The Marine Mammal Interpretation Center is 7 minutes’ drive from the motel. Golf Tadoussac is 2 minutes’ drive away. When would you like to stay at Motel le Beluga? This double room has a private entrance and balcony. A refrigerator and coffee machine are also available. House Rules Motel le Beluga takes special requests – add in the next step! Motel le Beluga accepts these cards and reserves the right to temporarily hold an amount prior to arrival. Please note that check-in is not possible after 20:30 between October 8th and November 5th, 2017. Please inform Motel le Beluga of your expected arrival time in advance. You can use the Special Requests box when booking, or contact the property directly using the contact details in your confirmation. The only small small thing was I didn't get more coffee and creamer when my room was cleaned in the morning so had to go and ask. The room was very clean but the soap dispenser was leaking in the tub, which got very slippery. We mentioned it to the staff at checkout who thanked us for our feedback and said it would be addressed. Nothing, it suited our needs for a one night stay. Extremely hot room made it very difficult to sleep. Noisy refrigerator also didn’t help. Would probably be better in winter. Very close to ferry, and walkable to all restaurants and the waterfront (as is everything in Tadoussac). There really wasn't anything not to like. This was a great bang for your buck at this time of year (end of October)! Beds are super comfy, room and bathroom very clean. Our windows faced highway but surprisingly quiet! Friendly staff. The water in shower smelled the sea. The comfort of the bed.